Air Force Chief of Staff Gen. David L. Goldfein addresses members of the Defense Writers’ Group in Washington, March 29, 2018. He said the new defense budget provides the Air Force with the people, money and time his service requires to address urgent issues. 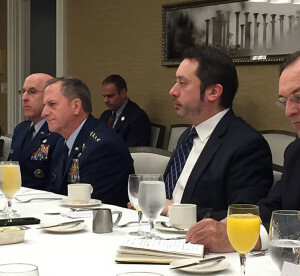 People, money and time are needed to address urgent issues the Air Force faces today, the service’s chief of staff told the Defense Writers’ Group in Washington, D.C., March 29. “When you walk those bases and you see lower levels of readiness, lower levels of manpower, higher levels of operational tempo as they not only prepare for a continual rotational to the Middle East — because that footprint hasn’t come down — but also ensure we have continued bomber presence, to ensure we have what’s required to support the pressure campaign and we’re doing that with less people, less parts on the shelves, less flying hours, you will find the morale there is not high,” he said.